Mairead McGuinness MEP for Donegal and first Vice-President of the European Parliament recently visited Robertson National School, Ballintra, which is participating in the Blue Star programme aimed at fostering, through classroom projects and activities, better knowledge and understanding amongst pupils about the European Union. 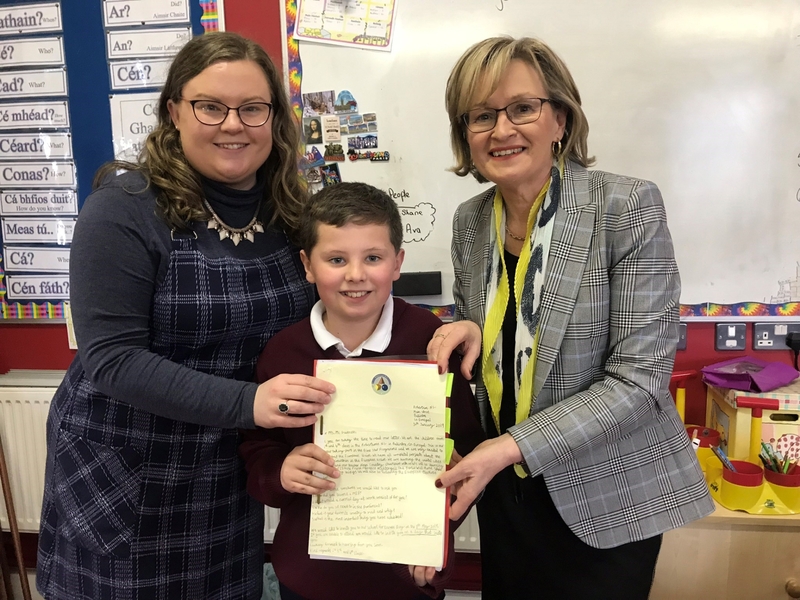 The visit took place after Ms. McGuinness received a beautiful hand written letter from Ben Murphy, a pupil in the school, inviting her to answer questions about her work as an MEP. “The questions were excellent and I hope I answered them to the satisfaction of the pupils in a video message I sent to the children,” she said. “I did say in the video that I would try and call to visit and last week I did just that! “It was a delight to meet the children and teachers in Robertson NS and to listen to their music and song. “The reception I received was warm and welcoming and I was so impressed by the wonderful display of all things European which hung on the walls of the school,” she added. The Blue Star Programme enables children learn about the foundation and development of the European Union, the cultural and linguistic diversity of Europe and the role of the EU: what it does and how its work impacts the lives of European citizens. “It was a pleasure to meet so many children of all ages who are enthusiastic about school and learning,” Ms McGuinness said. She said great credit was due to the students for the impressive work they had undertaken, to Blue Star teacher, Laura McGinley, School Principal Dawn Somerville and teacher Anne Gourly. “A special thanks to Ben for writing to me,” the MEP added.